This style of shoe was developed to be used on synthetic racing surfaces where the foot seems to plant and hold rather than getting the natural slide on landing that occurs in dirt or turf. The inability of the hoof to slide on synthetic surfaces seems to have created more soft tissue problems and this shoe was designed to minimize the grip or traction on landing. 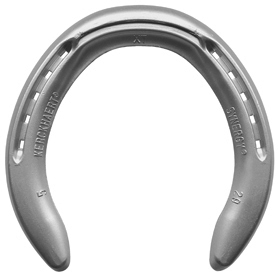 It has less crease, rolled edges and heels so the hoof can settle into the surface easier.